Why tracking sugar loading is important? Sugar accumulation rate (as you can see in Figure 1) indicates how the plant is faring during ripening. It is directly related to plant photosynthetic activity, the balance between leaf area and amount of fruit and the vine physiological condition. 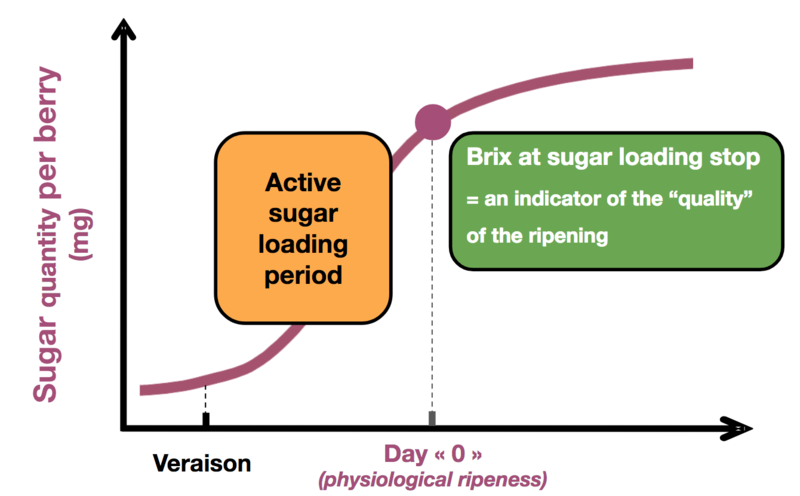 As such, tracking and assessing sugar loading variations reveal the combined effect of practices and vintage conditions onto fruit ripening time profile. Created by the company Vivelys, Dyostem® (Figure 2) is a tool revealing berry sugar accumulation profile. Berry sugar accumulation profile is useful to track how berries ripen in response to growing conditions and adapt harvest date decisions accordingly. Dyostem® requires a 200 berries sampling. In the lab, berry volume and sugar amount per berry are automatically and non destructively measured. Measurements of berry volume and sugar amount can be coupled with classic lab analysis. Analysis of berry volume and sugar loading time profile reveals precious information. It helps in understanding how different vine parameters and climatic parameters affect the ripening profile. The main vine parameters are leaf area development, nitrogen concentration, water status and crop load. Regarding climatic parameters, the main ones are heat accumulation, heatwave, night time temperature and relative humidity. Uncovering ripening variations at a berry level and connecting harvest date or irrigation decisions to berry volume and sugar accumulation variations give winemakers more power to improve the timing of key decision near harvest. To better understand how to use Dyostem®, and how to get access to it, please have a look at the following article.